If you’re a regular reader of my blog, you may recall that only a few months ago we went to Garmisch-Partenkirchen. That was never the plan. 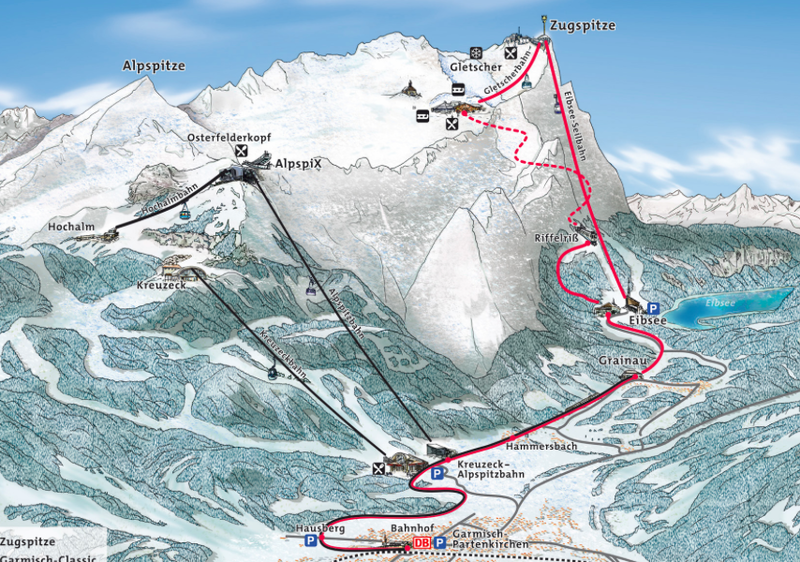 I’d actually booked Garmisch for the first time for Valentines Day weekend – we were never meant to go in October. We enjoyed our time there so much though that we decided to keep our booking for February and return to Bavaria. One, it’s an easy drive from where we live and two, I wanted to fulfill a lifelong goal. You see, Nick and I decided that 2016 was the year of ‘doing’. That means we were going to really focus on meeting goals that we had perhaps not been truthful to over time. Over the past couple of years I have felt like I have let myself drift away and lost a lot of self-confidence in the process. 2015 really sucked, and by the end of the year I had become someone who I kind of hated. At the end of the year I quit my job, which was a huge part of the problem. I couldn’t hide my distain for what I was doing and who I had become in the process of getting repeatedly knocked down over the past couple of years work-wise (there’s been no career in Germany). It killed me inside every day. I had to fix my life and my attitude – 2016 would be my year. So, what is this all about? Career wise, I was working on my CPA. Attitude wise, that would be harder to change. I’d always wanted to go skiing. I’d never had the confidence to, I’m my own worst enemy and I hate making a fool of myself, so instead of giving things a go, I just decide to not even try. That’s a horrible attitude to have in life and one that I’m trying to fix. Despite growing up 45 minutes from the nearest ski field in New Zealand, I hadn’t even been on a pair of skis in my life. 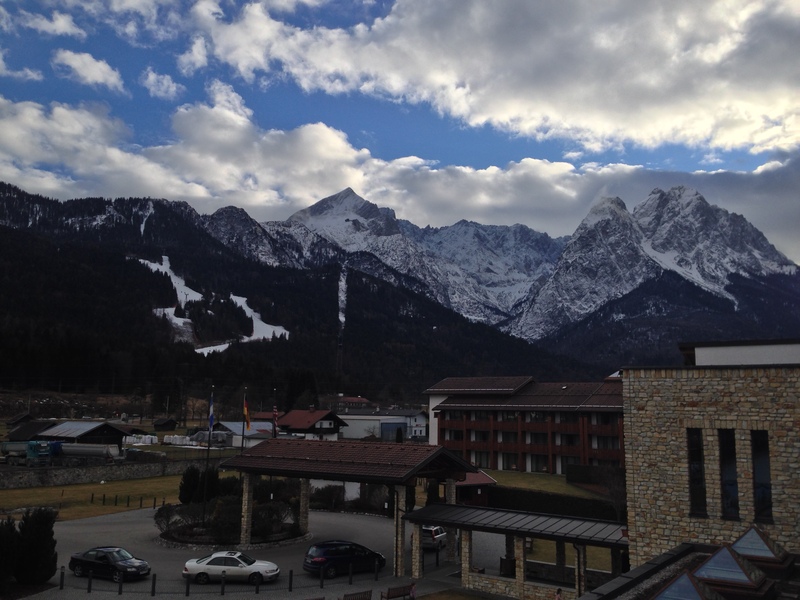 Due to Nick’s schedule we were able to set off early on Friday morning to Garmisch. It was the first time we’d got to do a decent drive in the new car and it was amazing. That car was definitely built for European road trips! The day was surprisingly clear and we knew that by the time we arrived in Garmisch that we would have the brilliant view of the alps that we had missed out on in October, when all we seemed to have was fog all day every day. On arrival, we checked in with the ski school. I was already getting second thoughts on the drive down. I was getting nervous, I was worried that everyone in my class was going to be better than me, I was worried that I’d fall over plenty of times, I was worried that the instructor would give up on me. Why am I telling you this? Considering half the people reading this blog may be a stranger to me? Well, I’m telling you this because sometimes people just need a confidence boost, and if I get through to even one person and that person gives whatever they’re worried about a go, then it’s worth it. It all went very smoothly. I was sized up with skis, boots, poles, helmet, a jacket and pants. There were lockers at the lodge so all I had to do was lock them away and then arrive the next morning, pop the clothes on and head out to the ski field. It was really convenient as we didn’t have to worry about having a car full of gear in the morning. Nick was going to be snowboarding the next day so it was already going to be chocca blocca (translation: packed) in the car. We headed back to the hotel and ate at the bar, of course having a margarita because why not? Oh my gosh. I was so nervous. I woke up wanting to back out of the class. Why did I do this to myself? You can’t teach an old dog new tricks. Infact, I actually messaged those exact words to my friend Liv in Australia. She replied “You’ll fine!” (Thanks Liv, I know you missed a word but it did the job). It was actually snowing when we woke up which was incredibly beautiful. Nick gave me the words of advice I needed, “Emma. Even if you don’t like what the instructor has to say, just give it a go and at least do it once.” He knows me too well. That’s exactly what I needed to hear and I heard those words go through my brain several times that day. There was a traffic jam on the way to the lodge. The barriers on the railway crossing didn’t go back up and the Germans didn’t know how to fix it. I ended up getting out of the car and walking to the lodge, which at least gave me a nice warm up for the morning. I quickly changed into the clothes and met the instructor, who was a super nice guy called Drew from San Diego who wanted to move to New Zealand. Bonus points immediately. I won’t go into the boring details, but they gradually stepped us up from wearing one ski at a time, to two and then down a bunny slope practicing turns by the end of the day. We weren’t allowed poles all day, they wanted us to learn without them. I feel like I had a huge amount of progress, I went from never having worn a pair of skis to being able to go down a hill making turns by the end of the four hours. Nick had actually met up with me at lunchtime. He’d been snowboarding all over the Bavarian alps. He watched a little of my class in the morning and then was checking in on me before the afternoon class. At the time I was saying that I was seriously considering not going back out for the afternoon. I’d already fallen over a couple of times, once just standing in line, and didn’t feel like I was getting it. I think he was convinced that that was it for me and I had given up. But, I don’t think he realized his words of wisdom were circulating in my head all day and I was going to at least finish the whole day out. That afternoon we started going up the slope. This was when I had the most wipe outs, and this was when I realized that falling over on snow was actually kind of nice. It didn’t hurt and it wasn’t a big deal, and to be honest, everyone was doing it. It didn’t help that the adult beginners were in the same area as the 5-10 year olds who were seriously awesome, but I realized that those kids were falling over and just didn’t care. They learned from their mistakes and I was going to do the same too. Drew also spent some one on one time with me and I learned what I was doing wrong. Once that clicked, I was good to go! I ended up spending some time on the slope after the class practicing and I ended up really enjoying it. I’m hoping that we can go again next year but in the meantime we are planning on visiting some indoor ski slopes in Europe. Yes there is such a thing! Hopefully by next winter I will be able to ski some real slopes. So, friends, the moral of the story is yes you can teach an ‘old dog’ new tricks. You just have to give it a go! And yes, you will be sore the next day from lifting yourself off the ground but those aches and pains remind you that you’re alive and isn’t that always a good thing?! That night we walked around downtown Garmisch which is a beautiful little village with a great walkplatz. There was a French food market that was wrapping up as we were leaving, but the most stunning part was the perfectly clear mountains as the sun went down and the lights turned on in the village. It was just gorgeous! Our dinner was at a delicious Indian restaurant called the Taj Mahal. I’m going to put a restaurant review up in the other area of my blog, but I’d highly recommend it for any visitors to the area. It’s the best Indian we have had in a long time! The night was finished off by relaxing in the hot tub at our hotel, with margaritas in hand. I’m so predictable! We woke up pretty exhausted but the weather was so beautiful that it seemed like the perfect day to go to the Zugspitze. I’m a little slow off the mark here, most people visit in their first year or so of living in Germany, but better late than never. We had planned to go up it in October but with the fog conditions it just wasn’t worth it. The Zugspitze is the highest mountain in Germany at 2,962m. Yes, it’s shorter than Mount Cook’s 3,724m but the difference is that a cable car goes to the peak of the mountain. We actually took a train up the mountain the first time and then the cable car back down. The view was stunning – there are peaks viewable from four different countries and at the top of the viewpoint you can step into Austria. The wind at the top was bitterly cold but so beautiful. We brought our own food up to the peak and sat on, staring out at the beautiful alps. There are actually ski and snowboard runs at the top of the mountain and we are hoping to next year come back and give them a go. There were a range of fields, from beginners to experienced, as well as sledding hills. After making our way back down, we were at a loss on what to do for the rest of Valentines Day. I had read about the Partnach Gorge and a few friends had recently visited. We decided to go and check it out as I had heard it was beautiful and conditions were still gorgeous. We parked at the free area of the Olympic Skiing Station, just behind the tennis courts otherwise parking costs but I’m unsure as to how much the charge was. We checked out the Olympic Stadium which was used in the 1936 Winter Olympics on the way. There were kids sledding using the slopes – some using cardboard or whatever they could find. The walk to the Gorge was around 25 minutes, which I’m glad we didn’t read about or our lazy selves with aching muscles probably wouldn’t have gone. It was totally worth it though. Entry was €4 each and so began our wandering through the beautiful valley. Photos do not do this place justice, just visit! The icicles and rapids were incredibly enchanting. Nature is such a beautiful thing. After all of the cities we have travelled through in Europe, they all tend to become one and the same. I know that sounds bratty to say, but hear me out. The things that really stick with you are the beautiful places, the experiences, the moments where you sit somewhere and think ‘I am so lucky to be here.’ I know that places like this Gorge, places like the mountains, places like the unspoiled beaches will stick with me forever. Gosh, this is turning into quite the blog! On our trip back home we decided to stop in at Dachau Concentration Camp. Nick had been before, but this was the first time I was visiting such a historic site since we moved to Germany. Dachau was a camp for political prisoners – those that the state did not approve of. It was not technically a ‘death camp’ but tens of thousands of prisoners died or were murdered during the years that it existed, including 4000 Soviet Prisoners of War. I didn’t realize this before visiting, but it was also where some medical experiments were carried out. They were experiments designed to test human endurance, such as altitude chambers and atmospheric conditions. It’s unbelievable to think what some ‘humans’ can do to others. While a lot of the camp is dismantled now, the museum has a lot of information and the signs are posted in both German and English. Entrance is free but the audioguide costs €3,50. To be honest, I didn’t really need the audioguide as the posted signs had more than enough information. Sometimes I forget that we are living in a country with so much of a traumatic past and visiting Dachau really reminded me of how recent it was in history that this all happened. Touching photos of the people who were actually trapped in the place that I was standing only 70 years ago. It’s really not that long ago, is it? I have captioned the photos with more information. Can we all appreciate this fine specimen? After that depressing experience, we decided to have a little more fun on the way home. We stopped at the Rittersport Factory in Stuttgart to grab some delicious chocolate. I would highly recommend stopping off on the way through, there were new flavours there that haven’t been released in shops yet and also a factory seconds area where you can buy chocolate by the kilo and chocolate flavours that are getting tested. Yum! 2kg bags of chocolate. Yes please! I feel like we packed a lot into our long weekend, hitting up places that we have been meaning to visit for awhile but hadn’t got around to. As we only have a little over a year left in Germany I see a few short weekend getaways with the dogs visiting places closer to home that we haven’t explored in the process of going to further away places.